Cannabics Pharmaceuticals, a leader in personalized cannabinoid medicine focused on cancer and its side effects, this month announced a partnership agreement with Eroll Grow Tech (“Seedo“), developer of the world’s first fully-automated grow device designed specifically for cannabis. Cannabics Pharmaceuticals, based in the US, was co-founded by Dr. Eyal Ballan, who Holds a Ph.D. in Neurophysiology from Tel Aviv University, and Eyal Barad, who has a BA in Economics from Hebrew University and an MBA from Haifa University. The company’s R&D is based in Israel. Eroll Grow-Tech, based in Zichron Yaacov, the developer of Seedo, holds a medical cannabis R&D license from the Israeli Health Ministry. Seedo has subsidiaries in the US and Europe. Seedo developed the world’s first fully automated device managed and controlled by an artificial intelligent algorithm and monitored by smart phone App. Seedo lets consumers grow their own herbs and vegetables in the comfort of their own home, effortlessly. Seedo controls and monitors the growing process, from seed to plant, while providing optimal lab conditions to assure premium quality produce year-round. The company’s goal is to simplify the growing process, making it accessible for everyone, with no compromising on quality. 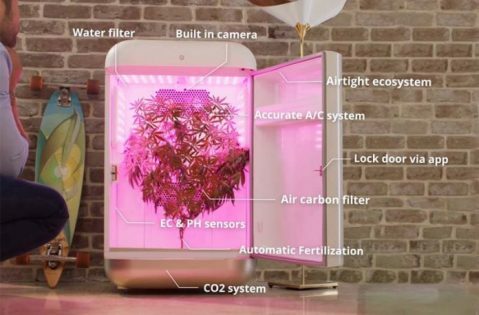 Through their new partnership, Cannabics and Seedo will develop the first controlled device for growing medical cannabis at home, ensuring sustainable quality and supply of natural, pesticide-free product. According to the agreement between the two partners, Cannabics Pharmaceuticals will purchase up to 20% of Seedo’s common shares, and receive royalties of up to $8 million with a minimum of $500,000 guaranteed for the 2019 fiscal year. Seedo will be allotted a warrant for one million Cannabics common shares at a price of $2.00 per share for a period of one year. The development of the home medical prototype device will begin in early 2019.